In order to increase awareness about the ''sneak thief of sight,'' January has been named National Glaucoma Awareness Month. Glaucoma is the leading cause of preventable blindness, responsible for 9%-12% of all cases of complete vision loss in the United States and effecting nearly 70 million people around the world. Since glaucoma has no early symptoms, experts believe that close to 50% of patients with glaucoma are unaware of their condition. Glaucoma is actually a group of eye diseases that have the common affect of causing damage to the eye's optic nerve, the conduit that transmits images from the eye to the brain. Although glaucoma can affect people of all ages, there are particular groups that are more likely to develop it such as African Americans over age 40, senior citizens, particularly Mexican Americans, and individuals with a family history of glaucoma. Because vision loss of this kind is irreversible, early diagnosis of glaucoma is imperative. This is difficult however, because symptoms are often not present before the optic nerve is damaged, and usually start with an irreparable loss of peripheral (side) vision. Treatment for glaucoma is determined based on the disease characteristics and the amount of damage, and includes medication (usually prescription eye drops) or surgery. While experts are researching a cure, it has not yet been found and therefore proper diagnosis and treatment are vital to prevent vision loss. 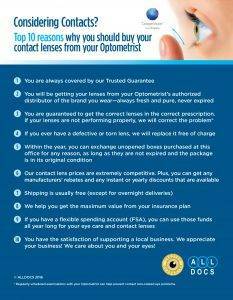 Since glaucoma is a lifelong disease, it is important to find an eye care professional you trust. According to a recent survey of the National Eye Institute of the NIH, while ninety percent of people had heard of glaucoma, only eight percent knew that it has no early warning signs. Only a qualified eye care professional can detect the early signs of glaucoma, using a thorough eye exam. An annual eye exam is the most effective way to protect your vision from this silent disease. Don’t delay in scheduling a comprehensive eye exam before it’s too late.